Asteroid Coaster is the sixth stage of Sonic Colours for the Nintendo DS. With Sonic and Tails coming closer to the final confrontation with Eggman, this level brings the fat man's twin loves of pollution and fatal danger to the Amazing Interstellar Amusement Park. A toxic planetoid brimming with deadly green ooze, Asteroid Coaster introduces the ghostly Void Wisp to vacuum up enemies, as well as the cyan laser wisp to ricochet off walls. 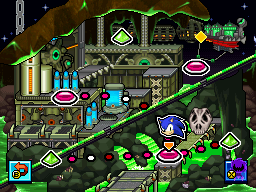 While insta-fatal green goo is the level's most obvious feature, Eggman has also installed a sideline in giant vents and turbines, which serve to direct Sonic's path through the skies in Void Wisp form. Wall Jumps and Skid Attacks are necessary features of Sonic's repertoire, in order to sneak through small gaps or up vertical routes. On occasion, a mistimed Skid Attack can spell rapid doom for the hedgehog, as pursit from giant snapping T-Rex skulls can only be evaded by deft maneuvering. Falling rocks and trips on the level's eponymous roller-coasters are also repeating features. Asteroid Coaster, in addition to being luminous green and generally unpleasant, is the place where Eggman hides his Nega-Wisp Factory - the machine which harvests Wisps' Hyper-Go-On Energy, and transforms the multicoloured aliens into crazed Frenzy and Void Wisps. While racing towards the chain generator, Sonic runs into Omega, who seeks to destroy Orbot and Cubot, though Sonic convinces him that they aren't worth the effort. Mission 2 sees Sonic and Tails stumble across Shadow the Hedgehog, who "sees no reason" to help the pair against Eggman, but challenges his rival to a mission in order to ensure he hasn't gone "soft". After rescuing the bumbling henchmen and completing Shadow's challenge, it turns out that he and Omega are searching for clues on a "secret ride". Upon further investigation, they discover Eggman's control room and uncover his plans for Project "Mother". Meanwhile, Tails hasn't seen Yacker in a while and begins to worry. After shutting down the plant, the Wisps are freed and Sonic and Tails head back to Tropical Resort to celebrate. A short optional tutorial teaches the player how to use the Violet Void color power. Asteroid Coaster Act 1 introduces the Violet Wisp. Spikes are scattered across the act, presenting a challenge for Sonic when wall jumping or platforming. In the latter part of the act, asteroids will begin to fall from the sky rapidly. The toxic pools here can kill Sonic in one hit. Act 2 features more roller coaster action than Act 1. Toxic pools are more present and hazardous, and Sonic must avoid being crushed by dinosaur heads while riding the roller coaster. The Violet Wisp also gets more usage in this act, as it is required to pass some toxic pools.